A Mala is a Buddhist, Tibetan, or Hindu rosary of prayer beads. 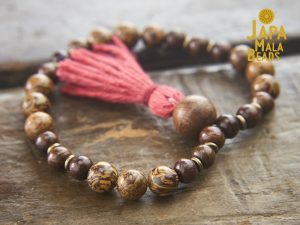 Meditating on each mala bead using a prayer, affirmation, or mantra, is an ancient Eastern technique to create tranquility and peace of mind. 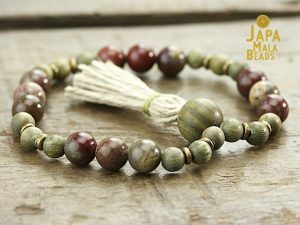 There are many ways to honor the power and importance of malas and one of the most common is to use it for japa meditation. 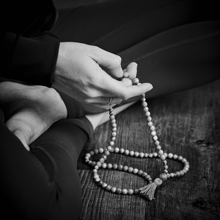 In japa, the individual mala beads are used to keep count while chanting or repeating a mantra while meditating. 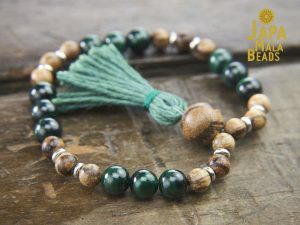 All of our mala bead jewelry is handcrafted using only the highest-quality materials, such as sacred wood beads and genuine semi-precious healing gemstones. Our malas are made with a traditional guru or meru bead and hemp tassels. Our wrist mala beads are made with 27 counting beads and are specifically designed to be worn as a bracelet. Our full mala beads are made with 108 meditation beads and work best worn as a necklace. Our healing gemstone mala beads are handmade in the USA with high-quality semi-precious gemstones. We sell a selection of Tibetan and Buddhist malas imported directly from India and Nepal. We sell over 160 different types of mala beads and of our malas available for purchase are listed below. You may find it easier to shop our subcategories to browse our necklace malas with 108 meditation beads or our bracelet malas made with 27 meditation beads. 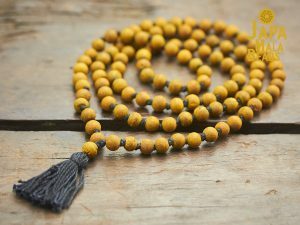 You may also find it very helpful to read about the many different methods on how to choose a mala.